As an open source project, the Cinder community welcomes anyone interested in helping to document the library and/or write guides to help other developers progress their understanding of the library. There are many different ways to contribute to this documentation and this guide is meant to walk through those different avenues. You may want to take a look at the Building Docs guide before reading this one. This step uses Doxygen to generate a series of XML files, one for each namespace, class, struct, and interface in the library and a master tag file (cinder.tag) which encapsulates the relationships between all of those files. 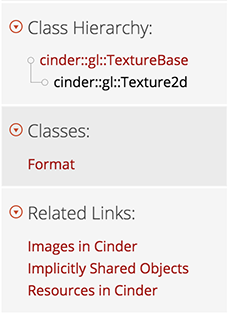 The Cinder documentation framework includes a mechanism to add documentation to a class' specific documentation page, as well as a method to easily link to specific pages of the documentation from your HTML files. The integration happens via a Python script, generateDocs.py, that parses all of the information and exports an HTML directory, ready for consumption. This is a brief overview of the new docs/ directory structure. Names in gray specify dynamically generated files and folders that you won't see unless you generate the docs. stylesrc/ - contains style source files, including Stylus (which is the preprocessor of choice) source files and a gulp config file. xml/ (generated by DoxyWizard) - all of the files containing data for each source file documentation page. All of the inline comments within the Cinder source code are turned into documentation in the Doxygen export step. For instance, if you open up a header file, you will commonly see block comments above each method that look like this. /** \brief Constructs asynchronously a Surface from an images located at \a path. The loaded Surface is returned in \a surface. If you are creating a Surface from an image that is located outside of the WinRT Windows Store App folder, you must use this method. Note that not If you want to do anything complex, it's highly recommended that you instead contribute to external documentation, as described below. To write supplemental documentation and guides for the docs, there is a separate process. All external documentation is written in HTML and lives in the htmlsrc/ directory. You can refer to the Docs File Structure for specifics. Unless you are contributing to the overall documentation site markup, you will be mainly concerned with the _docs and guides directories. The _docs directory includes markup and additional assets for class descriptions, while the guides directory includes all of the Cinder guides' markup. Before we go into the specifics of writing each type of external docs, let's look at the <ci> tag. To assist in bridging the gap between the Cinder source reference pages and the supplemental HTML markup, we've created a special <ci> tag. This tag is used to specify any content within the supplemental documentation HTML that needs to be linked into the source reference, as well as to provide a way for reference pages to link back to our guides. When writing guides, you may frequently want to reference specific source code constructs, such as a class, namespace, function, or enum. Since the docs are dynamically generated it's prohibitive to worry about the specific linkage. The ci tag makes it easy to link to a specific source code reference entry. An <ci>Fbo</ci> represents an OpenGL Framebuffer Object. An <a href="../../classcinder_1_1gl_1_1_fbo.html">Fbo</a> represents an OpenGL Framebuffer Object. Take a look at this test file to see a list of different combinations. To avoid polluting the Cinder library header files, you can write additional class descriptions in a separate HTML file and have it injected into the actual class' description. We do this by placing all of your content into a ci tag, giving it an attribute of prefix and setting the dox attribute to the class that you are documenting. If you want your guide to link from all classes in a namespace, you can simply specify the just the namespace. This is useful for broad guides pertaining to bigger topics, like audio. Once those specific class reference pages are generated, a link to the guide will appear in the class detail side bar under "Related Links". Create a new directory within the docs/htmlsrc/guides directory. The name of the directory should be short and descriptive (ex: audio, mac-setup, cinder-blocks, etc). If you have multiple pages, create a config file. Add meta keywords that can be used for searchability within the docs. Add any <ci> seealso tags to classes that may be relevant (This can also be part of the config for multiple pages). For your convenience, you can optionally include a config.json file for if your guide has multiple pages. This file allows you to specify the pages in your guide for subnavigation, specify meta keywords for every page in your guide, rather than specifying these for each individual page. <code>gl::ScopedGlslProg</code> is a scoped glsl shader. We encourage you to use whatever web technologies that will make your documentation as helpful as possible, including the use of WebGL. To do so, you should be able to write your WebGL sample entirely in a separate file and save in the same guide directory. Then you can embed your sample into an iFrame. All assets within the guide's directory will be copied over. Note: Due to file system security measures, WebGL samples that rely on asset loading will not show up when viewing your guide via the file system. You will have to spin up a local server to view it, which should be pretty common if you are writing WebGL in the first place. When generating a source file documentation page, by default, all of the html files will be generated so that the script can link up referenced pages. To skip over that step, you can use the -s flag.